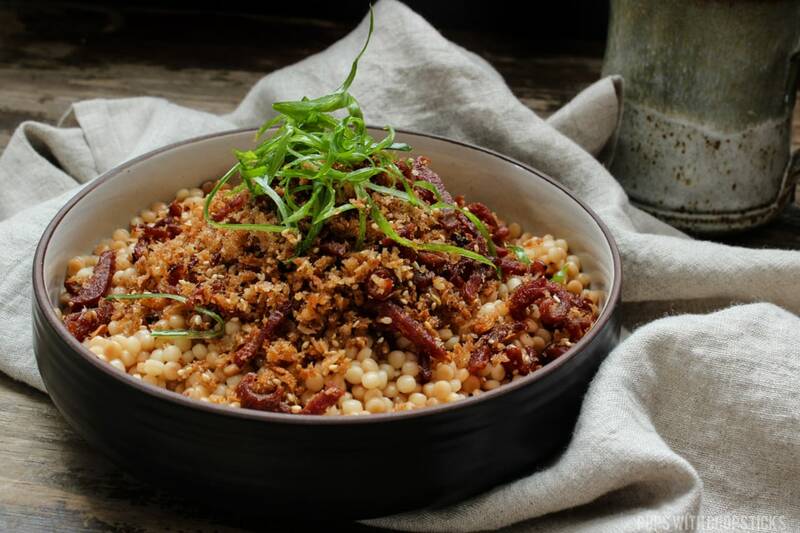 For this particular recipe, I used garlic and anchovies and Chinese sausage (lap cheong) to give the Israeli couscous a kick in flavour, umami and a good dose of saltiness. Since the bread crumb topping is quite salty from the anchovies, I kept the Israeli couscous very tame to balance it out. That being said, I like to use the toasty bread crumb technique for a lot of my plain pasta, rice and noodle dishes because I find it an easy way to flavour your dishes with only a few minutes of effort so I encourage you to play around with flavours and spices like I do! 🙂 If you find an awesome combination of flavour that goes well with the nutty breadcrumbs, please share! I love hearing different ideas and switching up my ingredients. 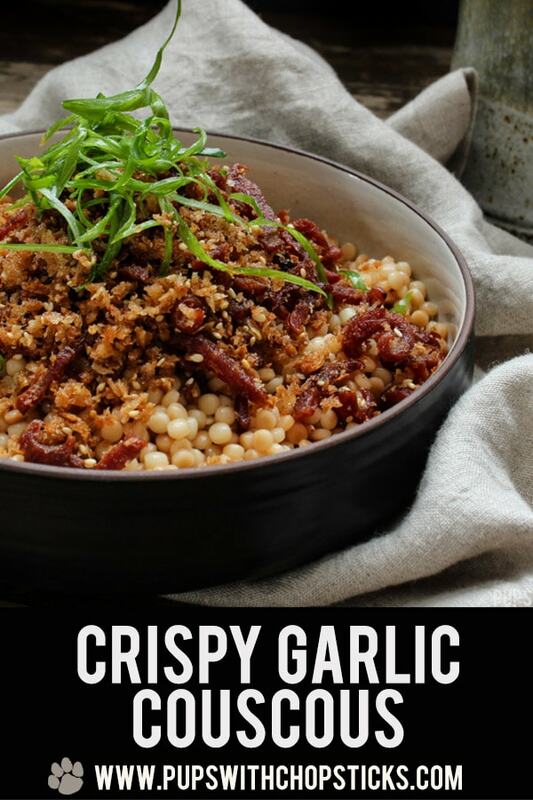 For this crispy garlic Israeli couscous recipe, you can find most of the ingredients at your local grocery store. For this recipe I used anchovies in oil. This is the bread crumb topping’s main salt and umami source. Unfortunately, I do not have a recommended substitution for this ingredient but I highly recommend keeping a jar in the fridge if you ever find it. It stores for quite a while and can be used in a lot of different types of recipes and is definitely an interesting ingredient to play with. 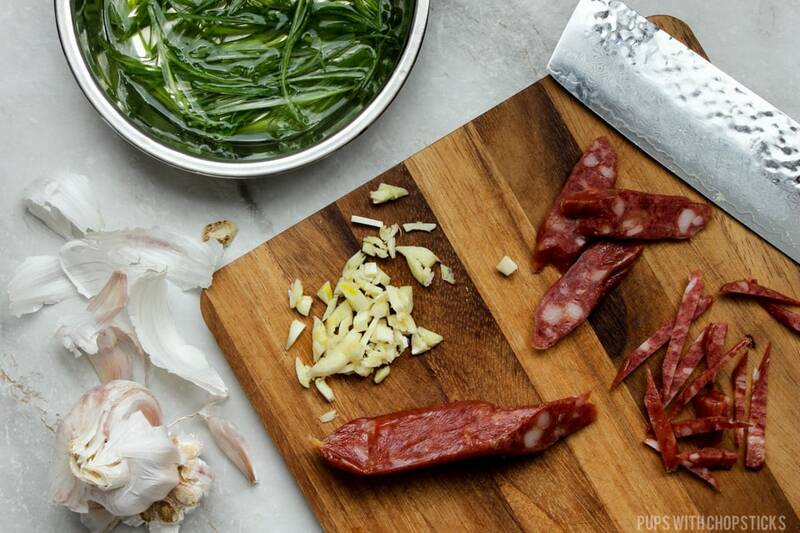 One of my salt (and meat) sources for this recipe is Chinese Sausage (lap cheong). It gives a slight sweetness with a bit of saltiness as well. This is available at an Asian grocery store or online. You can substitute it with bacon if you cannot find Chinese sausage but bacon will have a bit more of a smoky flavour and less of a sweet flavour. For any type of bread crumb topping recipe, I highly recommend and prefer to use Japanese panko bread crumbs because I find that it has a lighter and more crispy texture than the conventional bread crumb. If you do choose to use regular bread crumbs, try to stay away from the Italian seasoned one because they have additional salt and spices in it pre-mixed. Just keep in mind that regular bread crumb might not give you much of that crispy texture. 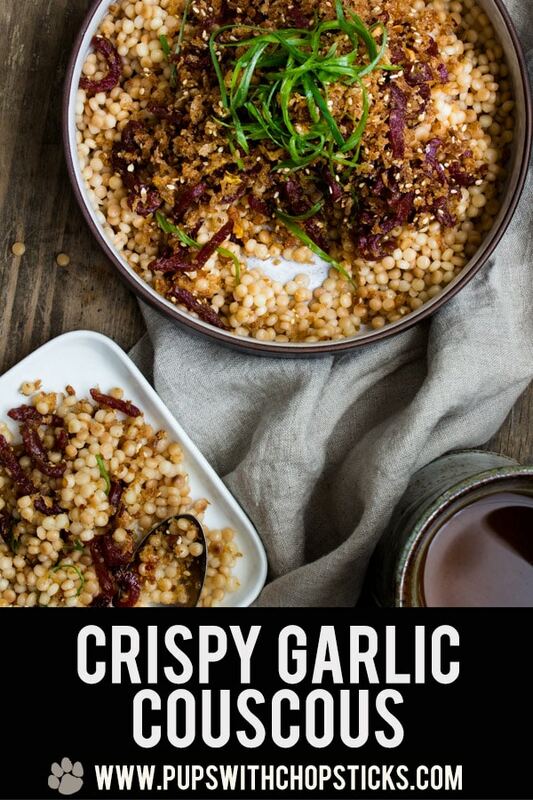 Toasting your Israeli Couscous is a Must! 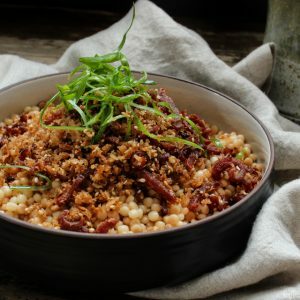 Whenever I use Israeli couscous as is, I find the end product always has a very strong starchy, musty flavour and tends to overpower anything I cook with it. One day, I decided to toast these little guys, since toasting usually makes things nuttier and tastier and to my surprise it worked! It transforms the couscous to a completely new flavour. The end product is nuttier and the starchy flavour is almost non-existent – so I HIGHLY recommend toasting these before using them. 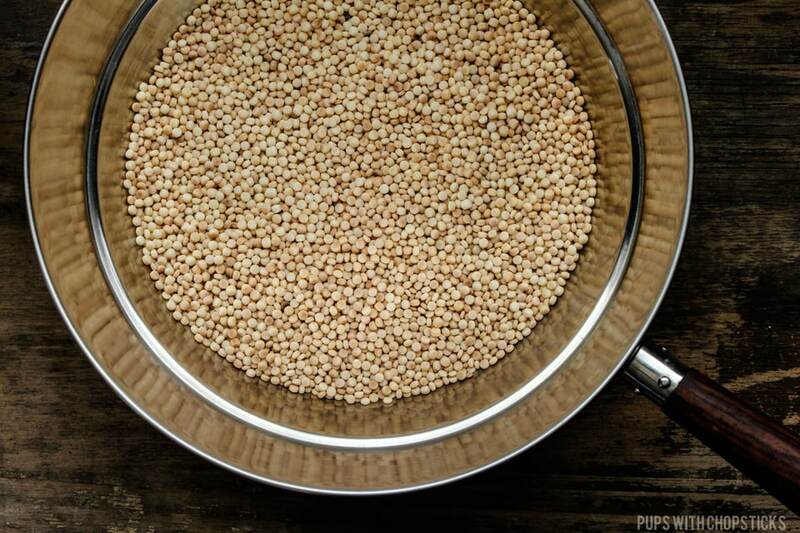 While you are toasting Israeli couscous, make sure to keep the pan moving and do it on medium low heat. They tend to burn quickly if you leave it on one spot unattended. If you’re like me, tilting your frying pan and dumping the contents of it into the boiling broth just makes sense right? and it does but not in this case. It causes an aggressive bubbling reaction and can potentially overflow the pot, so to make sure that doesn’t happen I just put in one heaping tablespoon of the toasty Israeli couscous into the boiling liquid to jump start the mini bubbling and after that you can usually keep adding a few more tablespoons and then eventually dumping it all in with no crazy eruptions. Once the stock has come to a boil, carefully add in the toasted couscous one tablespoon at a time to prevent the stock from bubbling violently and overflowing the pot. After 15 minutes, check to see if all the moisture has been absorbed into the couscous, if it hasn’t keep the lid on for another 1-2 minutes or until the couscous has absorbed all the stock. Use a fork and fluff up the couscous to separate the grains once it is done. Add in the butter, anchovies and garlic and toast it for 3-5 minutes until the butter and garlic turns brown. Once the anchovies get a bit of heat on it, they can be easily broken down into itty bitty little pieces with the spatula. Try to break it up as small as you can so it can melt into the butter and so you don’t end up eating chunks of it. 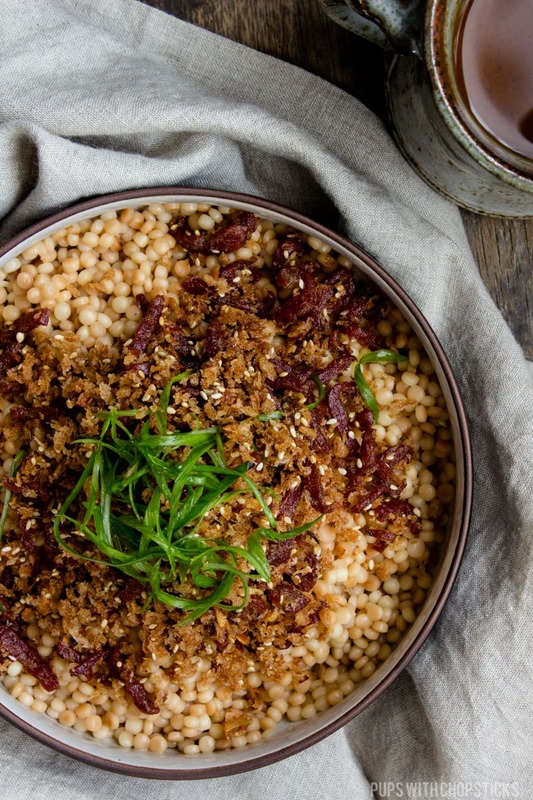 Once the breadcrumbs are crispy, turn off the heat and assemble the Israeli couscous bowl. 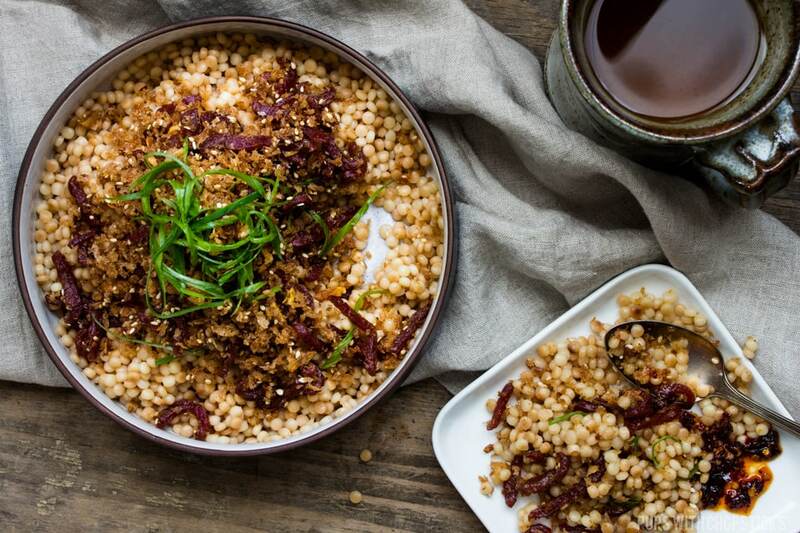 Transfer the Israeli couscous to a bowl, and top it with the crispy topping and enjoy! 🙂 Be sure to mix it a bit before eating it so you don’t get a mouthful of really salty breadcrumbs. I usually cook couscous in different ways. However, your way to do this unique dish that I shall follow. I am going to have to try this for sure! I’m getting hungry just thinking about it! 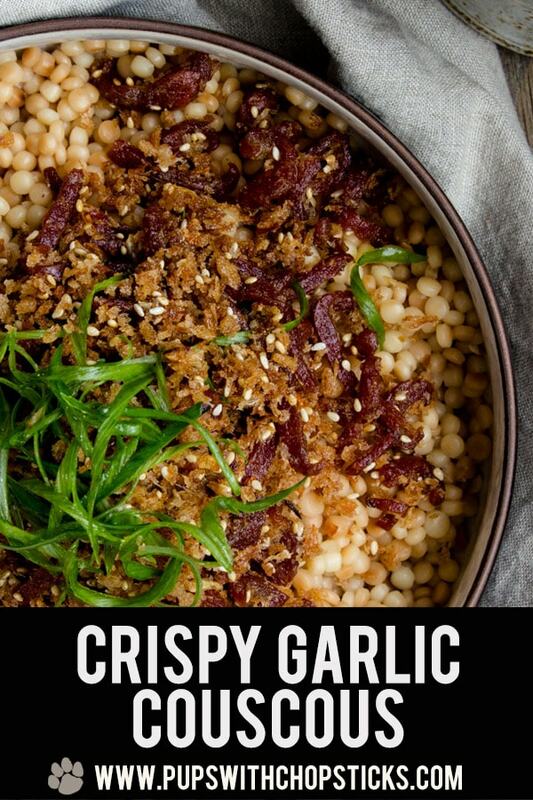 Everything about this recipe sounds amazing, but you definitely got me with the whole crispy garlicky breadcrumb topping! I love cous cous but I don’t cook with it enough, as I run out of ideas. This looks like a delicious way to enjoy it. Love the mix of flavors – delish! 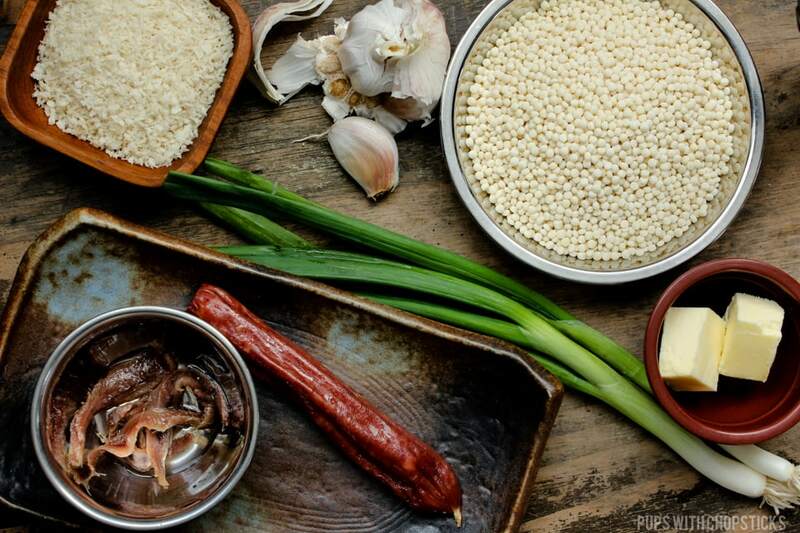 garlic + anchovies + lapcheong sounds awesome!!! couscous is pretty plain, so adding all of those flavor bombs seems perfect. and panko > normal breadcrumbs any day.